Bacteria are mostly beneficial, even though a minority are known as pathogens. They are necessary for natural processes such as human digestion and biogeochemical cycling. In a pre-Fall (“very good”, Genesis 1:31 ) world, all bacteria must have been nonpathogenic, and many of the functions they were designed to perform originally can still be seen in a post-Fall world. However, as a result of the Fall, some bacteria now cause disease. Bacteria have pathogenic mechanisms that are very complex and specific (to the host). Genomic islands (GEIs), specifically pathogenicity islands (PAIs), typically harbor the genes necessary for the pathogenic mechanisms of bacteria and are thought to be important determinants of pathogenicity. These islands are gained through horizontal gene transfer (HGT) from other bacteria. Interestingly, comparisons of the genomes of pathogenic and nonpathogenic strains of bacteria have shown that many suspected PAIs reside in both and that PAIs themselves are insufficient for pathogenicity. I propose that bacterial pathogenicity is the result of multiple events in any given bacterium (vs. singular events) that occurred after the Fall and that no intentional pathogenic mechanisms exist. In the post-Fall world, mutations and HGT of GEIs are factors that have resulted in pathogenic bacteria. In addition, the host may have suffered changes (genetic or otherwise) that altered the relationship between itself and the bacteria resulting in pathogenicity. Another factor in pathogenesis may be the exploration of new environments by bacteria that they were not originally designed to interact with. This may be due to changes in the bacteria (HGT of GEIs and mutation) that allow them to explore new niches. It may also be due to host or environmental changes that allow bacteria (with or without genetic alterations) to explore new niches. Displacement and genetic alteration (through mutation and HGT) in the post-Fall world are likely necessary for the adaptation and survival of bacteria but in some cases also have the “side effect” of pathogenicity in living things. Many studies have clearly shown that bacteria have been designed with the remarkable ability to adapt to numerous differing environments. This paper will explore pathogenicity as a post-Fall event in which bacteria have adapted to novel environments due to combinations of mutation, HGT of GEIs, and displacement. A creation model of the origin of bacterial pathogenicity will be developed based on the findings. The multiple roles played by bacteria could be described by the phrase “the good, the bad, and the ugly.” Although commonly associated with disease, it has been established that most bacteria play “good” or beneficial roles. For example, bacteria form a symbiotic relationship with humans and many animals that is necessary for proper digestion of food. Only a small minority of bacteria are disease-causing or pathogenic. Their “bad and ugly” roles are exemplified by the bacteria Streptococcus pyogenes that literally eats flesh (also known as necrotizing fasciitis). However, pathogenic bacteria are notorious, since they adversely affect health, agriculture, and the economy. It has been estimated that 10 million species of bacteria exist, but only about 5000 have been identified (Curtis, Sloan, and Scannell 2002; Staley 2006). Five to ten percent of those identified are pathogenic. If the estimate of the total number of bacterial species is correct then the percentage of total pathogenic species is predicted to be less than 1%. From a creationist perspective, it is expected that most bacteria would have beneficial roles, as all bacteria were originally created good. In the pre-Fall world pathogenic bacteria did not exist. Francis (2003) suggests that microbes (including bacteria, viruses, unicellular fungi, protists, and algae) were created as an organosubstrate. He describes the organosubstrate as “a link between macro-organisms and a chemically rich but inert physical environment, to provide a substrate upon which multicellular creatures can thrive and persist in intricately designed ecosystems” (p. 433). Francis (2003) gives many examples in support of the organosubstrate concept from symbiotic relationships of microbes with macro-organisms to the role of microbes in biogeochemical cycling. Gillen (2008) further extends this argument by suggesting that microbes were created on different days of creation (Days 3, 5, and 6). These days correlate with the life-forms with which the microbes have symbiotic associations. For example, Rhizobium on Day 3 with peanut plants, Vibrio fischeri on Day 5 with squid, and methanogenic bacteria on Day 6 with cattle. Thus, God created bacteria as a link between the physical world (water, soil, atmosphere) and the living world (plants, animals, and humans). As a result of the Fall ( Genesis 3 ), all of creation was cursed ( Romans 8:22–23 ), including bacteria. Many bacteria continued in their originally created beneficial roles which are still widely observed today. However, some bacteria became pathogenic to plants, animals, humans, and even other microbes. What exactly caused this change from nonpathogenic to pathogenic bacteria? Unfortunately, the creationist literature on the topic of microbes and pathogenesis is scant. Bergman (1999) addresses the subject of pathogenic viruses and suggests they are the result of mutation and/or the transfer of inappropriate genes. Wood (2001) suggests that genome decay (mutations) has led to pathogenicity in mycoplasmas. Wood (2007) suggests more generally that pathogenicity is more likely to result from the addition of DNA (through lateral transfer) versus degeneration through mutations. Francis (2003) suggests that pathogenicity may be the result of the lateral transfer of pathogenicity islands or the modification of current symbiotic relationships. A comprehensive creation model for the origin of bacterial pathogenicity is needed. Bacterial pathogenic mechanisms are complex and specific (in relation to their host). One example is the type III secretion system (T3SS) used by many pathogenic bacteria to inject protein effectors into host cells that modify the cell functions to the advantage of the bacteria. The T3SS has been referred to as a “complex nanomachine” (Cornelis 2006) and its components are encoded by approximately 25 genes and the system itself is regulated by a series of complex interactions (Blocker, Komoriya, and Aizawa 2003). Mutations only modify existing structures, so they cannot be responsible for the origin of the T3SS. The genes for T3SS commonly reside on genomic islands (GEI) called pathogenicity islands (PAI). GEIs are commonly transferred among bacteria through horizontal gene transfer (HGT). However, the mere existence of T3SS on these islands does not explain the origin of the secretory system, but only its ability to be transferred among bacteria via islands. Mutations and HGT of GEIs by themselves are inadequate to explain the origin of T3SS and many other complex pathogenic mechanisms as well. Given the complexity and specificity of pathogenic mechanisms and the cessation of God’s creative work on Day 6, I propose that no intentional pathogenic mechanisms exist and bacterial pathogenicity is the result of a combination of events that did not occur in a pre-Fall world. Alterations post-Fall have led to pathogenicity. These alterations are likely combinations of mutations, HGT of GEIs, and/or host changes. For example, T3SS has been discovered in several nonpathogenic, symbiotic bacteria such as Mesorhizobium loti, a symbiont of legumes (Hentschel, Steinert, and Hacker 2000). Mutations of T3SS in symbiotic Sinorhizobium fredii and Rhizobium sp. NGR234 affect their ability to form relationships with their host plants (Preston, Haubold, and Rainey 1998). T3SS was also found to be essential for the development of a symbiotic relationship between Sodalis glossinidius and the tsetse fly (Ochman and Moran 2001). It is likely that T3SS was originally created (pre-Fall) for use in symbiotic relationships, but alterations in the bacteria or host in a post-Fall world have led to its current function in pathogenic bacteria. Bacteria are master adapters and must be in order to survive in the harsh environments of the post-Fall world. Many of their genetic alterations are not random but rather adaptive in nature allowing them to adapt specifically in relation to their environment (Purdom and Anderson 2008). However, a “side effect” of this adaptation to specific ecological niches may also result in pathogenicity to the detriment of other living organisms. In addition, displacement of bacteria to new ecological niches due to genetic alterations or changes in the host or environment allowing bacteria to explore new ecological niches (with or without genetic alteration) may also play a role in pathogenicity. For example, adherence factors (such as fimbriae) are found on GEIs and produced by nonpathogenic strains of Escherichia coli that are part of the normal gut flora (Hacker and Carniel 2001). If those same E. coli are displaced to the urinary tract the GEIs now become PAIs, as the adherence factors produced allow the E. coli to establish itself in the bladder or kidney causing infection (Hacker and Carniel 2001). Thus, the same mechanisms can be nonpathogenic or pathogenic depending on the ecological niche that bacteria occupy. Evolutionary ideas of pathogenesis contradict the creation model. Pathogenic bacteria of both animals and plants share common mechanisms. A known plant pathogen, Erwinia chrysanthemi, has genes homologous to virulence genes in the human pathogens B. pertussis and Haemophilus influenzae (Kim et al. 1998). Similar lysozyme-like virulence factors have been found in Agrobacterium tumefaciens (plant pathogen) and pathogenic enterobacteria (Mushegian et al. 1996). From an evolutionary perspective this is unexpected considering the divergence of plants from animals millions of years ago. Bacteria infecting animals would be expected to have developed very different mechanisms for pathogenicity than those infecting plants considering the enormous differences between animals and plants at the cellular, anatomical, and physiological levels. From a creation perspective God’s original design included bacteria that interacted with one another and their environment [the organosubstrate model (Francis 2003)] including both plants and animals. Thus, more similarities would be expected versus differences. The occurrence of certain steps in the infection process [of Rhizobium-legume symbioses] that seem to be recruited from [sic] or are vestiges of a pathogenic interaction (p. 1908). This concept is in direct opposition to the biblical creation model that all bacteria were originally designed and created for commensal/symbiotic associations and this was altered by the Curse leading to pathogenic bacteria. Erroneous ideas concerning the origin of pathogenesis could have a negative impact on the development of prevention strategies and therapeutic treatments for bacterial disease. Most cancers arise due to multiple factors such as genetic predisposition, environmental factors, and multiple mutations. Multiple changes also appear to be required for bacterial pathogenicity (Groisman and Ochman 1996; Hentschel and Hacker 2001). A creation model of bacterial pathogenicity will be developed based on the exploration of possible mechanisms responsible for the origin of pathogenicity: mutation, HGT of GEIs, and displacement. The following overview is provided to show the complexity and specificity of pathogenicity. Included in each section is also a discussion of how pathogenic functions may originally have been nonpathogenic. Two major types of toxins are associated with pathogenic bacteria. Endotoxin is found in the cell wall of Gram negative bacteria and is released when the bacteria are lysed. This toxin causes a generalized reaction in the host such as fever and inflammation. Exotoxins are proteins released from Gram positive and Gram negative bacteria that have specific effects on host cells. For example, the cholera toxin (CT) secreted by Vibrio cholerae enters intestinal epithelial cells and causes the secretion of water, sodium, potassium, and other substances into the intestinal lumen resulting in dehydration of the host. Bacterial cells have specialized machinery that secrete the toxins and many toxins appear to be host specific and tissue specific. Bergman (1997) relates that determination of toxicity of a compound is more a matter of dosage, timing, and location than the actual compound itself. Even water and oxygen can be toxic! The botulinum toxin released from the bacteria Clostridium botulinum can cause paralysis and even death if ingested. However, this toxin has also been used successfully in the treatment of many nervous system disorders such as dystonias and strabismus. The toxin nitric oxide (NO) commonly used as a defense mechanism by animal cells in response to invading pathogens is used by the squid Euprymna scolopes to indicate the correct location to V. fischeri for colonization (Davidson et al. 2004). Francis (2008) suggests the CT toxin released by V. cholerae may have beneficial functions in aquatic organisms. Toxins are known to modulate host cell-cycle, host cell cytoskeleton, and many host cell signaling molecules (Finlay and Falkow 1997; Oswald et al. 2005) It is plausible that toxins in the pre-Fall world had maintenance and regulatory roles, especially in the digestive and nervous systems, since many toxins target these systems. Alterations to bacteria or host in the post-Fall world may have led to use of toxins in pathogenesis. In order for bacteria to colonize a host they must be able to adhere to and/or invade host cells. Adherence is accomplished through pili or fimbriae on the bacterial cell surface or through substances secreted from the bacteria. The host cell has receptors on its surface that bind to the bacterial adherence factors. For example, Helicobacter pylori bind specifically to a blood group antigen found on surface mucous cells of the gastric mucosa (stomach) (Finlay and Falkow 1997). Individuals lacking this specific blood group antigen are much less likely to become infected with H. pylori (Finlay and Falkow 1997). The adherence process can trigger changes in the host cell which facilitate intake of the bacteria (invasion) as in the case of many food-borne pathogens such as Salmonella and Shigella (Finlay and Falkow 1997). Groisman and Ochman (1997) state, “Surprisingly, apoptosis and host cell invasion exhibit several of the same phenotypic and genotypic requirements” (p. 345). 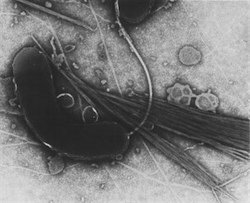 Both Salmonella and Yersinia induce apoptosis of host macrophages (Groisman and Ochman 1997; Monack et al. 1997). A pre-Fall world would not disallow apoptosis (a form of programmed cell death) as cells do not fit the definition of living in a biblical sense (but certainly in a biological sense). Symbiotic bacteria may have been responsible for host cell apoptosis as part of normal maintenance and regulation of host systems. In a post-Fall world, a combination of these same mechanisms (adherence and invasion) and other alterations has resulted in pathogenic bacteria. Pathogenic bacteria must be able to avoid the immune system to be successful in colonizing and infecting the host. Some bacteria bind host proteins and mask their own antigens, some inhibit the ability of immune system components to bind, some form a capsule that is not recognizable by the immune system, and some vary their surface antigens to avoid immune recognition (Finlay and Falkow 1997). Creation immunologist Dr. Joseph Francis suggests, “Rather than viewing the immune system as we know it today—a defense system against microbes—we should view it as a sensory system designed to interact with beneficial microbes” (Francis pers. comm.). Our immune system may have been designed to sense our environment and interact with microbes accordingly in a beneficial manner. For example, the immune system of grain weevils is important for the maintenance of a mutualistic relationship with the endosymbiont Sitophilus zeamais (Reynolds and Rolff 2008). Symbiotic bacteria of the GI tract have been shown to possess factors necessary for the proper development of the host immune system (Mazmanian et al. 2005). In a post-Fall world the immune system also defends us against pathogenic microbes. Avoidance mechanisms used by pathogens (as just one factor of their pathogenicity) may have been originally designed to allow beneficial bacteria to interact with their host without being destroyed by the host. In the post-Fall world alterations in the bacteria or host now aid pathogenic bacteria in avoiding immune detection. Gram negative bacteria use several types of secretion systems to transport virulence factors to the cell surface and host cells. The type III secretion system (T3SS) was discussed in the Introduction to this paper. The type IV secretion system (T4SS) is used by H. influenzae and H. pylori for the secretion of virulence factors (Finlay and Falkow 1997). T3SS and T4SS also typically transport other substances besides virulence factors. As discussed in the Introduction, T3SS is not exclusively found in pathogens and is in fact important for the development of symbiotic relationships of some bacteria. T4SS is also not exclusive to pathogens and has been discovered in the symbiont M. loti, where it is believed to secrete proteins (Sullivan et al. 2002), and in Wolinella succinogenes, a symbiont of the bovine rumen (Dobrindt et al. 2004). Interestingly, the genes for T4SS in these symbionts are very similar to genes for T4SS in known pathogens. It is likely that these secretion systems in the pre-Fall world were important for the development and maintenance of symbiotic relationships but alterations in bacteria or host in the post-Fall world have led to the use of these systems for secretion of virulence factors by pathogenic bacteria. Both pathogenic and nonpathogenic bacteria require iron for growth. For pathogenic bacteria iron can be a limiting factor for growth since iron is typically bound to high-affinity, iron biding proteins like transferrin and lactoferrin (in mammals). Some bacteria, like H. influenzae, bind directly and specifically to transferrin and lactoferrin and obtain iron (Finlay and Falkow 1997). Bacteria may also secrete siderophores (that is, the siderophore yersiniabactin is secreted by pathogenic Yersinia) that have a higher affinity for iron than the host’s proteins (Hacker and Carniel 2001). Iron can also be limiting in the environment, and the genomic island known as “high pathogenicity island” (HPI) which encodes yersiniabactin is also found in the nonpathogenic soil bacteria Klebsiella (Hacker and Carniel 2001). As in the case of the secretion systems, it appears that alterations to the bacteria or host have allowed these iron-acquiring systems to be used by pathogenic bacteria in a post- Fall world. In the pre-Fall world it is plausible these iron acquiring systems were necessary for symbiotic bacteria to grow in their host. These results demonstrate that such factors as adhesins, iron uptake systems, and proteases do not necessarily have to be considered virulence-associated factors but can also contribute to the fitness and adaptability of nonpathogenic bacteria (p. 5436). Bacteria and host appear designed to interact with one another and in the pre-Fall world this would have been either a symbiotic or commensal relationship. Changes in bacteria or host or both have led to the pathogenicity of originally helpful/benign bacteria. The previous examples also illustrate that multiple changes are required for bacteria to become pathogenic, as pathogenic and nonpathogenic bacteria share similar secretion systems, iron-acquiring systems, etc. Next we will look at bacterial mechanisms for change. Many of the proteins necessary for the previously discussed pathogenic functions are encoded by genes located on genomic islands (GEIs). GEIs are considered to be mobile genetic elements (MGE) that reside in the bacterial chromosome or plasmid and are defined as a segment of DNA that has been acquired by horizontal gene transfer (HGT). GEIs are typically large (10–200 kb) with smaller islets also observed (Hentschel and Hacker 2001). Island determination is made by using several criteria. The most commonly used criteria are sequence differences between the genomic island and the host DNA, which include codon usage, GC content, and the frequency of specific di- and trinucleotides (Hooper and Berg 2002; Karlin 2001). However, these are insufficient by themselves as amelioration (the process whereby the sequence of the island becomes similar to that of the host in GC content and codon usage due to mutational biases of the host) may occur and obscure the genomic island (Lawrence and Ochman 1998). Genomic islands that have been in the host genome for a long period of time are less likely to be identified as an island. Thus, our current estimate of genomic islands in bacterial species may be a gross underestimate. Another factor for determining islands is their occurrence in a particular species of bacteria but not in other closely related species such as pathogenic and nonpathogenic strains of the same species (Hacker et al. 1997). Also, islands are typically inserted in tRNA genes and are flanked by direct repeats (Hacker et al. 1997). tRNA genes are common integration sites for mobile elements (that is, phages) and tRNA genes are conserved among bacterial species (Williams 2002). Common integration sites are likely necessary for the integration of mobile elements among a variety of bacterial species. Using many or all of these criteria has been useful in identifying genomic islands. The origin and mechanism of transfer of genomic islands is unknown. They are thought to be derived from mobile elements such as phages and plasmids. Many islands have flanking direct repeats and genes encoding integrases and transposases which are commonly associated with phages and plasmids (Dobrindt et al. 2004). Most islands are not thought to be mobile due to the degeneration of genes necessary for transfer (Juhas et al. 2007a). However, recent evidence suggests that genomic islands may harbor unique mobility mechanisms that allow them to be transferred to other bacteria. The presence of a highly evolved and efficient conjugation system for mobilizing genomic islands provides a better explanation of how one family of genomic islands is able to propagate and efficiently enable bacterial populations to adapt to rapidly changing environments (pp. 770–771). The complexity and diversity of these transfer systems would seem to negate their evolution by random chance processes and indicate their design. Possibly different transfer systems are triggered by different environmental signals allowing the movement of islands that relate to the environmental conditions such as the movement of antibiotic resistance islands in the presence of antibiotics. Horizontal gene transfer of GEIs and other mobile genetic elements are common occurrences among bacteria. Nakamura et al. (2004) evaluated 116 prokaryotic genomes and found the percentage of horizontally acquired genes (based on several criteria) were on average 14%. The frequency of horizontal gene transfer varied depending on the bacterial species (Nakamura et al. 2004). Garcia-Vallvé, Romeu, and Palau (2000) in a smaller study found that nonpathogenic prokaryotes tended to have more horizontally acquired genes than pathogenic bacteria. Dagan, Artzy-Randrup, and Martin (2008) evaluated 181 prokaryotic genomes and over 500,000 genes and determined that 80% of the genes had been involved in HGT at some point. Again, these are likely underestimates since ancient transfers cannot be detected due to amelioration. Some doubt the role of HGT for alteration of bacterial genomes in the present but conclude it may have been common in the past (Kurland, Canback, and Berg 2003). However, common insertion points (tRNA genes), global regulators (discussed later) for regulating horizontally acquired genes, and high percentages of horizontally acquired genes (which must be the result of recent transfers or they could not be detected) make it seem likely that bacterial genetic information has been designed to move and that HGT is a very real phenomenon even today. In this way, gene movement in a bacteria should be considered as a result of a dynamic process of passive uptake and of quick selection on those genes appropriate for the current bacterial niche or their rapid elimination (p. 641). These processes [HGT and deletion] result in an extremely dynamic genome in which substantial amounts of DNA are introduced into (and deleted from) a chromosome, which may effectively change the ecological and pathogenic character of a bacterial species (p. 9416). HGT of genes (mainly located on islands) provide an important mechanism for allowing bacteria to adapt rapidly to changing environments. The result of this in a post-Fall world (especially one that was drastically altered by the Flood) may have led to adaptations of nonpathogenic bacteria which resulted in pathogenicity. Genomic islands often offer selective advantages; thus, according to their gene content, they can be described as pathogenicity, symbiosis, metabolic, fitness, or resistance islands (p. R237.2). GEIs are considered part of the flexible gene pool as they encode functions that are important only in certain environments (as opposed to the core gene pool which encodes essential functions) (Hacker and Carniel 2001). The flexible gene pool is thought to consist of mainly “operational” genes (that is, metabolism) as opposed to “informational” genes (that is, transcription, translation, etc.). Nakamura et al. (2004) found four main functional categories among horizontally acquired genes (many of which reside on islands) of 116 prokaryotic genomes analyzed. Categories were described as “plasmid, phage, and transposon functions,” “cell envelope,” “regulatory functions,” and “cellular processes” (Nakamura et al. 2004). Many of the genes in the individual categories (especially the last three) would cause changes such as surface attachment and changes in gene expression (Nakamura et al. 2004) that may have allowed bacteria to explore new niches. Significantly higher proportions of novel genes in GIs therefore cautions us that microbes may have a larger “arsenal” of novel genes for adaptations to environments, including resistance to antimicrobial approaches than previously thought (p. 547). It may be that God created a source of novelty (an “arsenal”) for bacteria knowing their need for adaptation in a post-Fall world. Genes on islands are typically clustered in the sense that all genes necessary for a specific function reside on the GEI. Thus, the acquisition of one GEI can lead to large changes in the bacterial phenotype (Hacker and Carniel 2001). The islands appear designed for mobility (as previously described), which is necessary for the ability of bacteria to survive in rapidly changing, harsh environments. Similar mobile “islands” are not observed in eukaryotes that employ different mechanisms for dealing with changing environments (Anderson and Purdom 2008). In order for GEIs/PAIs to be expressed and utilized by recipient bacteria they must be regulated appropriately. Global regulatory networks are part of the core genome and serve to regulate the bacteria’s own genes and those of acquired GEIs/ PAIs. One example of this is the PhoP/Q regulatory system. PhoP/Q senses environmental stressors and responsively alters genes in many nonpathogenic and pathogenic species (Finlay and Falkow 1997). PhoP/Q may be important for adaptive mutation of E. coli in response to lactose starvation (Purdom and Anderson 2008). In Salmonella the PhoP/Q system has been shown to regulate many virulence factors including survival in macrophages, resistance to host defenses, and cell invasion (Véscovi, Soncini, and Groisman 1996). Mutations in PhoP/Q attenuate the virulence of Salmonella indicating its importance in pathogenicity (Deiwick et al. 1999; Véscovi, Soncini, and Groisman 1996). The main trigger for activating the PhoP/Q system in Salmonella appears to be extracellular magnesium (Mg2+) levels (Véscovi, Soncini, and Groisman 1996). Low Mg2+ levels are encountered in the macrophage (cellular host of Salmonella). PhoP/Q in response to low Mg2+ causes changes in gene expression on three PAIs in Salmonella: SPI1, SPI2, SPI3. SPI1 has genes necessary for invasion of host cells, SPI2 has genes necessary for survival in macrophages, and SPI3 has genes necessary for magnesium transport (Blanc-Potard and Groisman 1997). In low Mg2+ environments, genes on SPI1 are repressed (Pegues et al. 1995) and genes on SPI2 and SPI3 are upregulated (Blanc-Potard and Groisman 1997; Deiwick et al. 1999). This correlates well with the known functions of these PAIs—only the genes on SPI2 and SPI3 would be needed after the Salmonella enters the macrophage. We have begun to appreciate that bacterial virulence factors do not operate in a biological vacuum. Rather, they are often expressed coordinately and are interdependent to achieve their biological effect on the host. Hence, upon receiving the appropriate cues, virulence genes are activated and proteins are synthesized and transported to precise cellular locations, where they are assembled into complexes that may be activated upon contact with the host or in response to a unique “cellular signature”. Thus, virulence factors may be controlled simultaneously by several regulators that measure different parameters, and several regulatory systems can regulate a single virulence factor (p. 156). The control of fitness factors or virulence factors, often found on GEIs or PAIs, is very complex. From an evolutionary perspective it is difficult to explain the evolution of these complex interactions from random chance alterations of islands and recipient bacteria. From a creation perspective the islands were designed to move and the recipient bacteria were designed to regulate the islands to increase adaptability and survival of bacteria in a post-Fall world. Although PAIs are the most commonly described type of GEI, many GEIs are also found in nonpathogenic bacteria. For example, M. loti forms symbiotic relationships with members of the Lotus species and has a large symbiosis island. This island has been shown to convert nonsymbiotic bacteria to symbiotic bacteria inferring that it contains most of the genes necessary for establishing symbiosis (Sullivan et al. 2002). The island contains genes involved in nodulation and nitrogen fixation and a large proportion of novel genes (Sullivan et al. 2002). Movement of this island to other bacteria allows them to explore new niches in a single step showing the potential power of GEIs for altering bacterial characteristics. PAIs were first described in uropathogenic E. coli in the early 1990s (Hacker et al. 1997). Since that time many PAIs have been described. However, the characterization of a GEI as a PAI is sometimes difficult. As can been seen in Dobrindt et al. (2004) Table 1, many PAIs contain genes for iron acquisition, secretion systems, adhesins, and toxin production. As mentioned in the section of this paper entitled “Overview of pathogenicity,” these mechanisms are also utilized by nonpathogenic bacteria. Thus, classifying any particular GEI as a PAI may be a misnomer. An example of this can be seen in the pathogenic bacteria H. pylori. Two strains of H. pylori, type I and type II, have been shown to vary in their ability to cause disease. Persons with type I strains are more likely to have ulcers and gastric tumors whereas persons with type II strains are typically asymptomatic (Censini et al. 1996). Both strains contain the vacA gene (vacuolating cytotoxin) but the gene is silent or encodes a non-toxic substance in the type II strain (Censini et al. 1996). Another gene associated with pathogenicity and located on a PAI, cag A (cytotoxin-associated gene A), is found in the vast majority of type I strains but is not present in the type II strains (Akopyants et al. 1998). Other genes on the cag pathogenicity island are similar to genes in Bordetella pertussis and A. tumefaciens that encode a T4SS that are important for exporting virulence factors (Akopyants et al. 1998; Kutter et al. 2008) and may be necessary for the transport of the vacuolating cytotoxin out of the cell. It appears that the combination of genes on the cag PAI and the presence of the vacA gene in type I strains leads to disease whereas the absence of the cag PAI in type II strains leads to asymptomatic strains, even though type II strains still possess the vacA gene (a known virulence factor). Thus, by themselves the vacA gene or the cag PAI may not truly be a virulence factor, but their combination through movement of GEIs (and possibly other alterations) results in the pathogenicity of the type I strain of H. pylori. Is the acquisition of a pathogenicity island sufficient to transform an organism into a pathogen? Three factors determine the virulence role of pathogenicity islands: the genes within the island, the status of the recipient microorganism, and features of the host that promote the progression of disease . . . the utility of sequences obtained through gene transfer varies within the organism (p. 793). Many examples will be discussed in this paper that shows multiple factors are necessary for pathogenicity and that the delineation between symbiosis and pathogenesis is not clear. From the analysis of the genetic and regulatory mechanisms of pathogenic and symbiotic interactions, no obvious distinguishing features are apparent (p. 228). The basic requirements [for pathogens and symbionts] involve overcoming the numerous physical, cellular, and molecular barriers presented by the host. Typically this entails contacting and entering the host body, growth and replication using nutrients from host tissues, avoidance of host defenses, persistence and replication, and finally exiting and infecting new hosts (p. 1096). These ideas fit well with the perspective that I propose that no intentional pathogenic mechanisms exist and that pathogenicity is due to a combination of events. The comparison of nonpathogenic and pathogenic species of the same genus illustrates the relatedness of and the difficult distinction between symbiotic/commensal mechanisms and pathogenic mechanisms. Many species of Neisseria are commensal (that is, lactamica, polysaccharea) with only a few being pathogenic (that is, meningitidis, gonorrhoeae) (Hotopp et al. 2006). N. meningitidis inhabits the mucosa of the human nasopharynx and is carried by 5–10% of healthy individuals (Bentley et al. 2007). Problems arise when the bacteria leaves the mucosa and invades the bloodstream leading to meningitis. N. lactamica also inhabits the human nasopharynx and is only very rarely associated with disease (Snyder and Saunders 2006). Comparisons of pathogenic Neisseria species with the nonpathogenic N. lactamica revealed that 93% of genes were common to all the species (Snyder and Saunders 2006). Of the 127 suspected virulence genes in the pathogens, a surprisingly 85 of them were also found in the nonpathogen (Snyder and Saunders 2006). The suspected virulence genes found in both pathogens and the nonpathogen fell into the categories of surface proteins, iron acquisition, pilus associated, and LPS biosynthesis/regulation (Snyder and Saunders 2006). Similar results were also found by Hotopp (2006). As discussed previously, these same functions would be necessary for nonpathogens and pathogens living in similar environments and do not represent intentional pathogenic mechanisms. Strains of N. meningitidis have been shown to accomplish variation of their surface proteins through a variety of mobile elements (such as islands) (Bentley et al. 2007) which may be responsible for a change in their nature from commensal to pathogenic. The similarity between the gene complements of the commensals and pathogens suggests that the virulence of the pathogenic Neisseria spp. may not lie within the genes they possess per se, but rather in a “genetic personality” which is a result of the combination of these genes, sequence variations that alter the function of gene products, the possession of genes for which a virulence phenotype has not yet been identified, and/or in differences in the regulation of genes between the species. . . . Without the specific combination of pathogenic-potential genes, N. lactamica can possess the “virulence genes” of the pathogens, yet remain a harmless commensal (p. 128). This adds further support to the concept that a combination of events is necessary for pathogenicity and that intentional pathogenic mechanisms do not exist. The presence of these genes in nonpathogenic species suggests that they promote survival within nutritionally deprived and/or potentially lethal environments that microorganisms encounter inside and outside animal hosts (p. 343). The distinguishing genes between Salmonella and E. coli are located on PAIs in Salmonella and are responsible for host recognition/invasion and survival in macrophages (Groisman and Ochman, 1997). It is conceivable that the PAIs (more appropriately termed GEIs) in Salmonella may have been obtained at some point in the past from nonpathogenic bacteria (possibly those that had a symbiotic relationship with macrophages) that then allowed Salmonella to explore a new niche. The combination of these GEIs with other genes in Salmonella led to their pathogenicity. Thus these organisms were preadapted [had the necessary components to survive in a host] to become pathogens upon the acquisition of additional virulence determinants encoded within pathogenicity islands (p. 1097). HGT probably did not occur among bacteria before the Fall due to an environment that did not present harsh or hazardous conditions. After the Fall, HGT would have been necessary to allow bacteria to adapt and survive, which unfortunately had the side effect of pathogenicity in humans, animals, and plants. Salmonella have been shown to secrete (through T3SS) a protein named AvrA that has homology to an avirulent protein secreted by the plant pathogen Xanthomonas campestris pv. vesicatoria (Hardt and Galán 1997). Complex interactions between the bacterial avirulent proteins and host proteins limit the spread of infection in plants. It is difficult to imagine the benefit of avirulent proteins to the bacteria as they serve to limit its ability to grow and survive on/in the plant. However, this interaction may be a remnant of the cross-talk that took place between symbiotic bacteria and their hosts in the past. Further support for this comes from the finding of homologs of avirulence genes in the symbiotic bacteria Rhizobium sp. NGR234 (Freiberg et al. 1997). Although the function of these homologs in Rhizobium is unknown, they may serve to limit the location of the bacteria to the area where they are needed. As was discussed earlier with Neisseria, location of the bacteria is an important factor in disease determination. It is plausible that animal and human symbionts and pathogens may share similar mechanisms for interacting with their hosts as plants [the animal pathogen Yersinia pseudotuberculosis also has a homolog of the Salmonella AvrA protein (Hardt and Galán 1997)]. From an evolutionary perspective bacterial avirulence genes likely developed and were selected for to weaken a highly pathogenic ancestral state. Killing of the host is not only detrimental to the host but also to the bacteria which resides in it, as the bacteria can no longer survive and be spread to additional hosts. A balance was achieved by the development and selection of avirulence genes. From a creation perspective the complex interactions of genes in both the bacteria and host necessary for these interactions to occur preclude their development by random chance evolution. Rather, the bacterial avirulent proteins and host proteins necessary for this interaction were designed. Originally (and possibly even today) they were/are utilized by bacteria and host for symbiotic interactions. Several studies have indicated that many of the virulence genes found in pathogenic E. coli (IPEC—intestinal pathogenic E. coli—and ExPEC—extraintestinal pathogenic E. coli) are also found in symbiotic/commensal strains of E. coli (Dobrindt et al. 2003; Grozdanov et al. 2004). Grozdanov et al. (2004) found that the nonpathogenic probiotic E. coli strain Nissle 1917 had many (over 50%) of the same genes found on PAIs in pathogenic E. coli. Many of these shared genes that code for iron uptake systems, adhesins, and proteases (Grozdanov et al. 2004). As described previously, these functions should not be thought of as intentional pathogenic determinants, as situations requiring these functions would be necessary inside and outside of a host and for symbiotic as well as pathogenic bacteria colonizing the same location. Dobrindt et al. (2003) found similar results when comparing the genome of E. coli K-12 (a lab strain) with IPEC and ExPEC genomes. Remember that some E. coli strains, such as the K-12 lab strain have not been “wild” for over a century and almost certainly have lost portions of their genome that are no longer needed for survival in laboratory conditions. Richard Lenski’s work with E. coli supports this (see Anderson and Purdom 2008) and is consistent with a creation model. Thus, genomic differences can be found between K-12 and newly isolated pathogenic E. coli that may be due more to degeneration than to pathogenic factors. If virulence correlates with the expression of virulence-related factors in pathogenic but not in closely related nonpathogenic variants, the presence of identical genes in pathogenic and nonpathogenic variants of one species indicates that some of their encoded factors (such as adhesins, iron uptake systems, or proteases) contribute to general adaptability, fitness, and competitiveness rather than to particular virulence traits. Consequently, it depends on the niche or growth conditions . . . to show whether certain fitness factors can also promote virulence (p. 5440). Thus, obtaining fitness factors may be an important first step to pathogenicity (that is, necessary for colonization) but cannot account for pathogenicity by itself. Other changes must happen or factors must be obtained for pathogenicity to occur. V. cholerae is a well known pathogen that causes cholera in humans. Its natural habitat is water (both fresh and salt). Francis (2006) has suggested that V. cholerae is important in the aquatic environment for chitin degradation. Its colonization of the human intestine may be the result of genetic modifications that have allowed V. cholerae to explore a new niche (Francis 2006). In addition, Francis and Wood (2008) have shown similarities of the CT gene cluster between V. cholerae and the symbiotic V. fischeri suggesting a possible symbiotic role for the cholera toxin. The SXT island of V. cholerae is known to confer resistance to several antibiotics (Beaber, Hochhut, and Waldor 2002). However, large regions of the SXT island contain genes with no known function and no homology to other genes (novel) (Beaber, Hochhut, and Waldor 2002). Islands similar to SXT have been found in Shewanella putrefaciens, which is a rare human pathogen naturally found in aquatic habitats similar to V. cholerae (Dobrindt et al. 2004). It is possible that the novel genes on the SXT island are fitness factors necessary for survival in aquatic environments (whether inside or outside a host). Beaber, Hochhut, and Waldor (2002) suggest that the antibiotic resistance genes and transposase genes on the SXT island are a recent addition. Deletion of these genes did not affect movement of the SXT island suggesting they were not part of the original island (Beaber, Hochhut, and Waldor 2002). Possibly the antibiotic resistance genes were gained at a later time as a necessary aspect of adaptation and survival to environments (such as the host) where antibiotics were present. Pathogenicity of V. cholerae may have resulted from a combination of displacement (new niche) and gain of antibiotic resistance elements allowing it to thrive in human hosts. A note of caution in interpreting these results is warranted. Many of the genomic comparisons between pathogens and nonpathogens resulted from DNA microarrays (based on hybridization) and not actual sequences for the genes. It is possible that although both pathogen and nonpathogen harbor the same genes that mutations have occurred rendering them active or inactive in a given species. Differences at the sequence level may be responsible for the pathogenic or nonpathogenic nature of some species and this needs to be addressed in future studies. The global gene repertoire of a bacterial species that comprises the sum of the core and the dispensable genome (from the Greek “pan”, meaning whole, and genome) (p. 420). Recent studies have shown that sequencing just one or even a few isolates of a particular bacterial species is inadequate for defining the genes present, genomic organization, etc. of the species overall. For example, comparisons of three E. coli genomes (lab strain K-12, uropathogenic strain CFT073, enterohaemorrhagic strain EDL933) showed that only 39.2% of the predicted proteins were present in all three strains, 11.9% were present in two of the three strains, and 46.5% were present in only one strain (Welch et al. 2002). The Streptococcus genus is believed to have a pangenome greater than 6,000 genes, which is on average three times the number of genes in any singular Streptococcus genome (Lefébure and Stanhope 2007). A large pool of flexible or dispensable genes appear to be present that are associated with differing strains of individual species likely correlating with the bacterial habitat occupied. Thus, more shared genes between pathogens and nonpathogens may exist (than established from microarray data), but it will be necessary to compare many more isolates from differing habitats to make this assessment. Actual differences between nonpathogens and pathogens, whether at the gene level or sequence level, will be important for determining the causes of pathogenicity. One big question is how do we determine if bacteria originally had a symbiotic relationship with the host that has become pathogenic or if it is a new relationship with the host that was pathogenic from the start (meaning after the Fall)? For example, bacterial siderophore systems are very specific to the host (see Iron Acquisition). It is unlikely that these systems would have been utilized in an environment outside the host, so it is likely that bacteria with these siderophore systems originally had a symbiotic relationship with the host. The same could be said for bacterial adherence, invasion, and avoidance mechanisms which are very specific to the host. Rather than being pathogenic mechanisms (as they are often viewed) they are fitness mechanisms that allowed symbiotic bacteria to survive in their environment. Additional changes through HGT of GEIs and mutations have led to their pathogenic interactions with the host. However, this does not rule out the possibility that bacteria not in symbiotic relationships with the host have gained these host specific systems via transfer of GEIs through HGT from symbiotic bacteria. Determination of whether the genes for these host specific systems are foreign or original may distinguish between original (symbiotic) and new (pathogenic) relationships. Mutations, although not responsible for the creation of complex and specific symbiotic/pathogenic mechanisms, play an important role in the development of pathogenicity. As the following examples will illustrate, it is the combination of mutations with other changes (such as HGT) that have likely led to the pathogenic nature of some bacteria. Shigella and E. coli (both pathogenic and nonpathogenic strains) have very similar genes and are believed to share a common ancestor. In fact they are so closely related that some think they should be classified as different strains of the same species. Shigella appears to be pathogenic for several reasons including virulence plasmids and two PAIs (SHI-1 and SHI-2) (Yang et al. 2005). In addition to these alterations through HGT, mutations may also be important for the virulence of Shigella. An important virulence factor in Shigella is the VirG protein. This protein is necessary for intracellular spreading of Shigella (Nakata et al. 1993) and is located on a virulence plasmid (Yang et al. 2005). E. coli also have proteins (OmpR and others) that are homologous to VirG that are thought to play a role in the regulation of envelope proteins (Melchers et al. 1986). Nakata et al. (1993) found that when the ompT gene (encoding a surface protease found in nonpathogenic E. coli) was added to Shigella its virulence was attenuated. Additional experiments confirmed that the attenuation was due to the effects of the OmpT protein on the VirG protein, presumably degradation (Nakata et al. 1993). Pathogenic enteroinvasive strains of E. coli also lack the ompT gene (Nakata et al. 1993) indicating the role of this gene in virulence suppression. VirG in Shigella and its homologs in E. coli may have beneficial functions but the deletion of the regulatory gene ompT has led to unregulated expression of these genes which has led to pathogenesis. Another factor believed to be important for the virulence of Shigella is the absence of the cadA gene encoding lysine decarboxylase (LDC) found in nonpathogenic strains of E. coli (Ochman, Lawrence, and Groisman 2000). LDC catalyzes a reaction which results in the product cadaverine. Cadaverine inhibits enterotoxins (Maurelli et al. 1998). Addition of the cadA gene to Shigella attenuated its virulence through the inhibition of the enterotoxins produced by Shigella (Maurelli et al. 1998). Again because of the proposed common ancestry of Shigella and E. coli it is believed that the deletion of the cadA gene from Shigella is important for the development of virulence (Ochman, Lawrence, and Groisman 2000). This example clearly illustrates the importance of mutations (specifically deletions) and HGT (plasmids and PAIs) for the development of pathogenic bacteria. Three species of the soil-dwelling Bacillus genus—cereus,anthracis, and thuringiensis—are very closely related genetically (Helgason et al. 2000). Just as with Shigella and E. coli some think that these three Bacillus species should be considered one species but different strains (Helgason et al. 2000). B. cereus is considered mainly nonpathogenic but is responsible for a minority of foodborne illnesses. B. anthracis and B. thuringiensis are both considered pathogens of animals and insects, respectively. B. cereus and B. anthracis have a plasmid, pXO1, which carries toxin genes (Parkhill and Berry 2003). However, B. anthracis appears to have a PAI on pXO1 and a nonsense mutation in the transcriptional regulator PlcR which is known to control virulence genes that are not found in B. cereus (Parkhill and Berry 2003). Mutation of the plcR gene in B. cereus and B. thuringiensis attenuate their virulence indicating the role of PlcR in regulating virulence genes (Salamitou et al. 2000). The virulence of B. anthracis is not affected when a functional plcR gene is added but its ability to form spores is reduced (Mignot et al. 2001). PlcR appears to have less to do with control of virulence genes in B. anthracis (its virulence genes appear to differ and virulence may be linked to the PAI inserted on pXO1) and more to do with survival and dissemination of the bacteria through sporulation. Thus, it appears that the addition of a PAI (through HGT) and mutation have led to the major differences in virulence between B. anthracis and B. cereus. It is likely that all members of Bacillus were created to be soil-dwellers involved in nutrient recycling, but changes through HGT and mutation have led to their ability to explore new niches in animals and insects that have had the “side effect” of pathogenicity in these organisms. L. pneumophila is an intracellular bacterium that resides in amoebas in what may be a type of endosymbiotic relationship. The bacteria can be aerosolized (in air conditioning systems or water distribution systems) and inhaled by humans. L. pneumophila is a human pathogen which causes Legionnaire’s Disease. Macrophages in the lung endocytose L. pneumophila, and the bacteria survive by inhibiting phagosome-lysosome fusion. The dot (defective for organelle trafficking) genes were found to be essential for preventing phagosome-lysosome fusion (Vogel et al. 1998). Recent studies have shown that the dot genes encode a T4SS system that is also found in Coxiella burnetti (causative agent of Q fever) (Pan et al. 2008). Pan et al. (2008) showed that Dot proteins were responsible for secreting protein effectors that inhibit phagosome-lysosome fusion. Vogel et al. (1998) showed that dot genes have homology to components of bacterial conjugation systems and can transfer plasmid DNA into E. coli. It has been suggested that the dot genes themselves may not be original to the L. pneumophila but rather acquired from another bacterium and may represent a PAI (Vogel et al. 1998). If the dot genes do represent a GEI that originally functioned as a DNA transfer system then they may have helped L. pneumophila establish a symbiotic relationship with amoebas. Mutations have been observed to broaden the substrates of enzymes in bacteria as seen in the ebgA gene (lactose degradation) (Purdom and Anderson 2008) and nylon degrading enzymes (Anderson and Purdom 2008). Mutations may have broadened the substrates of the Dot proteins to include effectors that allow the survival of L. pneumophila in human macrophages. The “side effect” of pathogenicity in humans may have occurred as L. pneumophila adapted and survived in this new niche. Again, the development of pathogenicity seems to have involved multiple steps, including acquisition of an island and mutation. It is also possible that the host itself has suffered mutations that have altered its relationship with bacteria causing formerly nonpathogenic interactions to become pathogenic. For example, bacteria responsible for opportunistic infections occur because the immune system of the host is compromised. In individuals with healthy immune systems these same bacteria do not cause disease. Since the Fall, animal, plant, human, and bacterial DNA have all been deteriorating, and so pathogenicity may be the result of changes to the bacteria as well as the host. It is proposed that the sum of the individual investments of the microbial partner and the respective host determines the outcome rather than the individual investments per se (Hentschel, Steinert, and Hacker 2000, p. 229). With opportunistic infections the investment of the host is weakened by a compromised immune system, and thus the investment of the bacteria is greater and the outcome is disease. With symbiotic interactions the investment of the bacteria and host are similar leading to healthy and helpful interactions. The interactions between bacteria and host are complex thus multiple changes to both the bacteria (HGT of GEIs and mutations) and host are likely necessary for pathogenicity to occur. Another factor in pathogenesis may be the exploration of new environments by bacteria that they were not originally designed to interact with. This may be due to changes in the bacteria (HGT of GEIs and mutation) that allow them to explore new niches. It may also be due to host or environmental changes that allow bacteria (with or without genetic alterations) to explore new niches. For example, Francis (2008) has suggested that the virulence genes of V. cholera may also be important in the breakdown of chitin (found in the exoskeleton of many marine organisms) in aquatic environments to recycle carbon. The cholera toxin may be important in salt metabolism for organisms as they move from fresh water to salt water (Francis 2008). The “virulent components” of V. cholera have roles in the natural aquatic environment of the bacteria and thus their natural role is not virulence at all. However, these same virulent components can cause disease when the bacteria are displaced to humans. A simple change in environment has led to the pathogenicity of V. cholera in humans not genetic alterations of the bacteria itself. The Flood itself likely had a major effect on the worldwide distribution of bacteria. Bacteria from deep in the earth were brought to the surface via the bursting open of “the fountains of the great deep” ( Genesis 7:11 ). Bacteria that were terrestrial (from the mountains to sea level), aquatic (salt and freshwater), and airborne were suddenly all mixed together. In addition, it is likely that animals that were sharing the close quarters of the Ark were never that close in their natural environments. After the Flood, many new niches would also be available such as caves, deserts, and ice sheets that may not have been present before the Flood. Exposure to many gene pools via the different bacterial species being mixed together and harsh conditions may have led to rapid changes in the bacterial genetic composition as they adapted to and survived in these new niches. Also, bacteria may have been able (such as V. cholera) to survive in the new niches without genetic changes. Human life spans dramatically decreased after the Flood, and part of this may be due to increased numbers of pathogenic bacteria following the Flood. Numerous bacterial genetic changes have been discussed throughout this article which may have allowed bacteria to explore new environments. The following is a brief overview of bacterial changes that may have resulted in the exploration of new niches. Host and environmental changes that do not include bacterial genetic changes will also be discussed. HGT can fundamentally alter the character of a microbial species by introducing fully functional genes and gene clusters that can confer complex phenotypes and functions that allow effective and competitive exploitation of new niches (p. 2232).
. . . we need not view the microbial niche as a static domain, within which fitter variations constantly arise and sweep through the population. Although an organism may evolve to improve its fitness within its current niche, it is more likely that gene acquisition will allow exploitation of a related environment. In this way, the microbial niche can be considered a dynamic domain, which is redefined after each gene transfer event. (Gogarten, Doolittle, and Lawrence 2002, p. 2232). As discussed previously, M. loti forms symbiotic relationships with members of the Lotus species and has a large symbiosis island. This island has been shown to convert nonsymbiotic bacteria to symbiotic bacteria, inferring that it contains most of the genes necessary for establishing symbiosis (Sullivan et al. 2002). Movement of this island to other bacteria allows them to explore a new niche in a single step. Nonpathogenic E. coli can be converted to enteropathogenic E. coli in a single step. A PAI known as LEE (locus of enterocyte effacement) allows enteropathogenic E. coli to attach to intestinal epithelial cells (McDaniel and Kaper 1997). When LEE is transferred to a nonpathogenic lab strain of E. coli, they display a similar virulent phenotype as the enteropathogenic E. coli (McDaniel and Kaper 1997). It is possible that LEE was once a GEI in symbiotic gut bacteria that was transferred to a strain of E. coli that possessed virulence genes, and this combination formed an enteropathogenic strain of E. coli. Providencia stuartii is a normal human gut bacterium that can also cause opportunistic infections. It contains an enzyme that has the physiological role of acetylating bacterial peptidoglycans (Macinga and Rather 1999). However, the peptidoglycan substrate is very similar to aminoglycoside antibiotics and this enzyme has been shown to inactivate antibiotics (Macinga and Rather 1999). The regulation of the production of the enzyme in P. stuartii is extremely complex involving many regulators (Macinga and Rather 1999). Martínez (2008) suggests that if the gene for this enzyme was transferred to another bacterium then the gene would be “out of context” (including abnormal regulation) and may cause the bacteria to be resistant to antibiotics. As discussed previously, bacteria in response to stress initiate a SOS response which may trigger increased levels of HGT (Beaber, Hochhut, and Waldor 2004). This would provide a mechanism for the bacteria to gain helpful genes to explore, adapt, and survive in new environmental niches. A single regulatory gene, rscS, in V. fischeri ES114 has been found to be responsible for determining their host range (Mandel et al. 2009). V. fischeri colonizes the bobtail squid E. scolopes and the rscS gene appears to be both sufficient and necessary for colonizing this squid (Mandel et al. 2009). However, a small change in this single gene could profoundly alter the hosts V. fischeri can occupy. The displacement of these bacteria to other hosts may or may not result in pathogenicity as other changes are likely needed as well. Changes in the host (that is, weakened immune system leading to opportunistic infections) or changes in the environment (natural or artificial) can also result in the exploration of new niches with or without genetic changes in the bacteria. For example, Pseudomonas luminescens is pathogenic to insects and animals but symbiotic in nematodes (Dobrindt et al. 2004). In this case the host, not the bacteria, determined the outcome of the bacterial-host interaction. As discussed previously, adherence factors (such as fimbriae) are found on GEIs and produced by nonpathogenic strains of E. coli that are part of the normal gut flora (Hacker and Carniel 2001). If those same E. coli are displaced to the urinary tract, the GEIs now become PAIs, as the adherence factors produced allow the E. coli to establish itself in the bladder or kidney causing infection (Hacker and Carniel 2001). In this case, no genetic change in the bacteria has occurred, but rather a displacement of the bacteria to a new environment. Dixon (2008) summarizes reports from several articles showing the effects of rising temperatures on cyanobacterial blooms that have led to increased incidence of disease in both animals and humans. Increasing temperatures brought about by global warming appear to be increasing the range of many cyanobacteria such that subtropical and tropical species are now being found in European countries (Dixon 2008). Some evidence also suggests that cholera, viral encephalitis, and plant diseases are on the rise due to climate changes such as El Niño and global warming (Dixon 2008). While there is a need to determine the effects of changing temperature and weather on microbes and diseases, there is also a need for caution in regards to the cause of these temperature and weather changes. It is likely that many of the temperature and weather fluctuations the earth is experiencing today are the result of natural causes rather than man-made causes (Christian 2009). Again, the bacteria have likely not changed genetically but rather are responding to or being displaced to new environments which have led to increased pathogenicity. Our results support the notion that antibiotics are not only bacterial weapons for fighting competitors but also signaling molecules that regulate the homeostasis of microbial communities. At low concentrations, they can even be beneficial for the behavior of susceptible bacteria in natural environments (p. 19484). P. aeruginosa causes opportunistic infections, thus a change in the host (weakened immune system), and the addition of antibiotics for treatment of the disease (if not at sufficient concentrations) has led to the pathogenicity of the bacteria with no genetic change in the bacteria itself. The same genes used to cause disease in the host are a necessary part of the bacterial genetic repertoire for survival in its natural environment. Finally, it seems reasonable to speculate that a human-driven increase in the concentrations of antibiotics in natural ecosystems may not only influence antibiotic resistance, but also affect the broader microbial population dynamics in different natural environments (p. 367). Thus, antibiotic resistance genes are not pathogenicity determinants, but rather part of the normal bacterial genome necessary for normal bacterial processes in the natural environment. Human impact may be responsible for increasing numbers of antibiotic resistant bacteria and the displacement of bacteria to a new environment (such as an animal or human host) which has led to their pathogenicity. The field of aeromicrobiology also presents interesting stories of displacement that are often underappreciated. Aeromicrobiology is defined as the study of microbes living in the air. It appears that bacteria have become adapted and specialized for the air they inhabit, whether it is high in the atmosphere or the air in a shopping mall (Borrell 2008). Borrell (2008) states, “Some 10,000 bacteria are present in every gram of airborne sediment, and the atmosphere contains at least one billion metric tons of dust.” Manmade changes such as deforestation and natural occurrences such as temperature changes have stressed and altered microbial communities (Borrell 2008). Some of these changes might be genetic via the initiation of stress responses, but changes may also occur in the number and composition of species within a community. Dust storms in Africa have been found to alter the numbers of airborne bacteria in the U.S. Virgin Islands and have been associated with increased incidences of asthma and even fatalities in some locations (Borrell 2008). Again, it is the displacement of bacteria through natural or manmade processes that has led to pathogenicity versus a change in the bacteria themselves. One final example worth noting is the effect of space flight on bacterial pathogenicity. Wilson et al. (2007) found that Salmonella typhimurium that had been grown on a Space Shuttle mission were more virulent than those grown on Earth. The increased virulence was attributed to the activation of Hfq, a global regulator (Wilson et al. 2007). Microarray analysis showed altered expression of genes known to be regulated by Hfq (Wilson et al. 2007). Hfq is known to respond to environmental stresses and promote virulence (Wilson et al. 2007). Space flight with its low gravity environment may be the stressor that initiated a stress response in S. typhimurium leading to its increased virulence in a host; however, this same response was necessary for its survival in space (pathogenicity is a “side effect”). Although the bacteria did not change genetically (through HGT or mutations) alterations in bacterial gene expression due to displacement resulted in increased pathogenicity of S. typhimurium. Ongoing research is still needed to resolve many unanswered questions. Some pathogens such as Mycobacteria, Chlamydia, and Streptococcus have no known PAIs (Schmidt and Hensel 2004). Schmidt and Hensel (2004) suggest that mutations may be responsible for pathogenicity and/or PAIs that are unrecognizable due to high levels of recombination. More research is needed to determine the exact cause of pathogenicity and how it was it acquired. To my knowledge, no comprehensive analysis has been performed investigating the relationship of the quantity and type of GEIs to bacterial type (that is, Gram positive versus Gram negative), behavior (that is, pathogen vs. nonpathogen), natural environment of bacteria, and other bacterial characteristics. Hacker et al. (1997) note that PAIs in Gram positive bacteria do not fit the traditional definition of PAIs associated with Gram negative bacteria. In addition, the comparisons of GEIs between pathogens and nonpathogens are typically based on microarray data versus comparisons of the actual sequences. As more bacterial genomes are sequenced this data should be analyzed in an effort to better understand the roles of GEIs in the development of pathogenicity. Many of the genes on islands are novel (Hsiao et al. 2005), which opens up another door of research into the determination of the source of these genes. One possible source could be species of bacteria that cannot be cultured or have not been sequenced. Metagenomics, the sequencing of entire microbial communities found in the environment without the direct culturing of bacteria, is a burgeoning field. Massive sequencing projects of metagenomes are currently being performed by Craig Venter and his associates. Another possibility is bacteriophages, which are estimated to be in great excess of the number of bacteria on earth (Francis 2008). The pangenome of many bacterial species may be a reflection of the vast number of novel genes available to bacteria. This “arsenal” of novel genes was likely designed by God to allow bacteria to adapt to the harsh environments of the post-Fall world. Determination of the arsenal source may be important in developing strategies to gain foreknowledge of future pathogens and/or prevent future pathogenic bacteria from arising. From the creation perspective, all bacteria were originally created “good” and important for many biological processes from the digestive processes of humans and animals to biogeochemical recycling in the environment. The vast majority of bacteria still perform these functions today. However, the Fall and subsequent curse placed on creation has altered some bacteria resulting in their pathogenicity leading to disease and death. Bacteria possess very specific and complex pathogenic mechanisms that cannot be explained merely as the result of mutations. A creation model is needed to understand how bacteria become pathogenic in a post-Fall world. This paper clearly shows that pathogenicity is a complex characteristic of bacteria that is the result of a multi-step process. Mutations do play a role (in both bacteria and host), but HGT of GEIs and displacement are also important factors in the development of pathogenicity. Mountains of evidence support the concept that no intentional pathogenic mechanisms exist, but rather what are observed as pathogenic are really modifications of symbiotic and/or benign mechanisms. This fits well with the creation model that all bacteria were created “good” and modifications in a post-Fall world have led to their pathogenicity. In order to survive in a post-Fall world, God designed bacteria with mechanisms to adapt. These include adaptive mutation (Purdom and Anderson 2008), HGT of GEIs, and likely many others that have yet to be discovered. As bacteria were displaced to new environments these mechanisms were crucial to their survival. Pathogenicity should be rightly viewed as a “side effect” of bacterial adaptation and survival in the post-Fall world and not part of God’s original “very good” ( Genesis 1:31 ) created world. Akopyants, N. S., S. W. Clifton, D. Kersulyte, J. E. Crabtree, B. E. Youree, C. A. Reese, N. O. Bukanov, E. S. Drazek, B. A. Roe, and D. E. Berg. 1998. Analyses of the cag pathogenicity island of Helicobacter pylori. Molecular Microbiology 28, no. 1:37–53. Anderson, K. L. and G. Purdom. 2008. A creationist perspective of beneficial mutations in bacteria. In Proceedings of the Sixth International Conference on Creationism, ed. A. A. Snelling, pp. 73–86. Pittsburgh, Pennsylvania: Creation Science Fellowship and Dallas Texas: Institute for Creation Research. Beaber, J. W., B. Hochhut, and M. K. Waldor. 2002. Genomic and functional analyses of SXT, an integrating antibiotic resistance gene transfer element derived from Vibrio cholerae. Journal of Bacteriology 184, no. 15:4259–4269. Beaber, J. W., B. Hochhut, and M. K. Waldor. 2004. SOS response promotes horizontal dissemination of antibiotic resistance genes. Nature 427, no. 6969:72–74. Bentley, S. D., G. S. Vernikos, L. A. S. Snyder, C. Churcher, C. Arrowsmith, T. Chillingworth, A. Cronin, et al. 2007. Meningococcal genetic variation mechanisms viewed through comparative analysis of serogroup C strain FAM18. PLoS Genetics 3, no. 2:0230–0240. Bergman, J. 1997. Understanding poisons from a creationist perspective. T. J. 11, no. 3:353–360. Bergman, J. 1999. Did God make pathogenic viruses? T. J. 13, no. 1:115–125. Blanc-Potard, A. and E. A. Groisman. 1997. The Salmonella selC locus contains a pathogenicity island mediating intramacrophage survival. EMBO Journal 16, no. 17: 5376–5385. Blocker, A., K. Komoriya, and S. Aizawa. 2003. Type III secretions systems and bacterial flagella: Insights into their function from structural similarities. Proceedings of the National Academy of Sciences USA 100, no. 6:3027–3030. Borrell, B. 2008. They came from above. The Scientist 22, no. 12:36–45. Censini, S., C. Lange, Z. Xiang, J. E. Crabtree, P. Ghiara, M. Borodovsky, R. Rappuoli, and A. Covacci. 1996. cag, a pathogenicity island of Helicobacter pylori, encodes type I-specific and disease-associated virulence factors. Proceedings of the National Academy of Sciences USA 93, no. 25:14648–14653. Christian, M. 2008. Global warming in perspective. Answers 3, no. 4:84–89. Cornelis, G. R. 2006. The type III secretion injectisome. Nature Reviews Microbiology 4, no. 11:811–825. Curtis, T. P., W. T. Sloan, and J. W. Scannell. 2002. Estimating prokaryotic diversity and its limits. Proceedings of the National Academy of Sciences USA 99, no. 16: 10494–10499. Dagan, T., Y. Artzy-Randrup, and W. Martin. 2008. Modular networks and cumulative impact of lateral transfer in prokaryote genome evolution. Proceedings of the National Academy of Sciences USA 105, no. 29:10039–10044. Dantas, G. M., O. A. Sommer, R. D. Oluwasegun, and G. M. Church. 2008. Bacteria subsisting on antibiotics. Science 320, no. 5872:100–103. Davidson, S. K., T. A. Koropatnick, R. Kossmehl, L. Sycuro, and M. J. McFall-Ngai. 2004. NO means ‘yes’ in the squid-vibrio symbiosis: Nitric oxide (NO) during the initial stages of a beneficial association. Cellular Microbiology 6, no. 12:1139–1151. Deiwick, J., T. Nikolaus, S. Erdogan, and M. Hensel. 1999. Environmental regulation of Salmonella pathogenicity island 2 gene expression. Molecular Microbiology 31, no. 6:1759–1773. Dobrindt, U., F. Agerer, K. Michaelis, A. Janka, C. Buchrieser, M. Samuelson, C. Svanborg, G. Gottschalk, H. Karch, and J. Hacker. 2003. Analysis of genome plasticity in pathogenic and commensal Escherichia coli isolates by use of DNA arrays. Journal of Bacteriology 185, no. 6:1831–1840. Dobrindt, U., B. Hochhut, U. Hentschel, and J. Hacker. 2004. Genomic islands in pathogenic and environmental microorganisms. Nature Reviews Microbiology 2, no. 5: 414–424. Ernst, J. D., G. Trevejo-Nuñez, and N. Banaiee. 2007. Genomics and the evolution, pathogenesis, and diagnosis of tuberculosis. The Journal of Clinical Investigation 117, no. 7:1738–1745. Finlay, B. B. and S. Falkow. 1997 Common themes in microbial pathogenicity revisited. Microbiology and Molecular Biology Reviews 61, no. 2:136–169. Francis, J. W. 2003. The organosubstrate of life: A creationist perspective of microbes and viruses. In Proceedings of the Fifth International Conference on Creationism, ed. R. L. Ivey Jr., pp. 433–444. Pittsburgh, Pennsylvania: Creation Science Fellowship. Francis, J. W. 2006. The role of virulence factors in the establishment of beneficial ecological relationships of Vibrio cholera and Vibrio fischeri. Occasional Papers of the BSG 8:13–14. Francis, J. W. and T. C. Wood. 2008 The CT toxin of Vibrio cholera, its structure, function and origin. Occasional Papers of the BSG 11:7. Francis, J. W. 2008. Creation microbiology and the origin of disease. Answers Research Journal 1:1–6. Freiberg, C., R. Fellay, A. Bairoch, W. J. Broughton, A. Rosenthal, and X. Perret. 1997. Molecular basis of symbiosis between Rhizobium and legumes. Nature 387, no. 6631:394–401. Garcia-Vallvé, S., A. Romeu, and J. Palau. 2000. Horizontal gene transfer in bacterial and archaeal complete genomes. Genome Research 10, no. 11:1719–1725. Gillen, A. L. 2008. Microbes and the days of creation. Answers Research Journal 1:7–10. Gogarten, J. P., W. F. Doolittle, and J. G. Lawrence. 2002. Prokaryotic evolution in light of gene transfer. Molecular Biology and Evolution 19, no. 12:2226-2238. Groisman, E. A. and H. Ochman. 1996. Pathogenicity islands: Bacterial evolution in quantum leaps. Cell 87, no. 5: 791–794. Groisman, E. A. and H. Ochman. 1997. How Salmonella became a pathogen. Trends in Microbiology 5, no. 9: 343–349. Grozdanov, L., C. Raasch, J. Schulze, U. Sonnenborn, G. Gottschalk, J. Hacker, and U. Dobrindt. 2004. Analysis of the genome structure of the nonpathogenic probiotic Escherichia coli strain Nissle 1917. Journal of Bacteriology 186, no. 16:5432–5441. Hacker, J., G. Blum-Oehler, I. Mühldorfer, and H. Tschäpe. 1997. Pathogenicity islands of virulent bacteria: Structure, function and impact on microbial evolution. Molecular Microbiology 23, no. 6:1089–1097. Hacker, J. and E. Carniel. 2001. Ecological fitness, genomic islands and bacterial pathogenicity. EMBO Reports 2, no. 5:376–381. Hain, T., C. Steinweg, C. T. Kuenne, A. Billion, R. Ghai, S. S. Chatterjee, E. Domann, et al. 2006. Whole-genome sequence of Listeria welshimeri reveals common steps in genome reduction with Listeria innocua as compared to Listeria monocytogenes. Journal of Bacteriology 188, no. 21:7405–7415. Hao, W. and G. B. Golding. 2006. The fate of laterally transferred genes: Life in the fast lane to adaptation or death. Genome Research 16, no. 5:636–643. Hardt, W. and J. E. Galàn. 1997. A secreted Salmonella protein with homology to an avirulence determinant of plant pathogenic bacteria. Proceedings of the National Academy of Sciences USA 94, no. 18:9887–9892. Helgason, E., O. A. Økstad, D. A. Caugant, H. A. Johansen, A. Fouet, M. Mock, I. Hegna, and A. Kolstø. 2000. Bacillus anthracis, Bacillus cereus, and Bacillus thuringiensis— One species on the basis of genetic evidence. Applied and Environmental Microbiology 66, no. 6:2627–2630. Hentschel, U., M. Steinert, and J. Hacker. 2000. Common molecular mechanisms of symbiosis and pathogenesis. Trends in Microbiology 8, no. 5:226–231. Hentschel, U. and J. Hacker. 2001. Pathogenicity islands: the tip of the iceberg. Microbes and Infection 3, no. 7:545–548. Hooper, S. D. and O. G. Berg. 2002. Detection of genes with atypical nucleotide sequence in microbial genomes. Journal of Molecular Evolution 54, no. 3:365–375. Hotopp, J. C. D., R. Grifantini, N. Kumar, Y. L. Tzeng, D. Fouts, E. Frigimelica, M. Draghi, M. M. Giuliani, R. Rappuoli, D. S. Stephens, G. Grandi, and H. Tettlin. 2006. Comparative genomics of Neisseria meningitidis: Core genome, islands of horizontal transfer and pathogen-specific genes. Microbiology 152, no. 12:3733–3749. Hsiao, W. W., K. Ung, D. Aeschliman, J. Bryan, B. B. Finlay, and F. S. Brinkman. 2005. Evidence of a large novel gene pool associated with prokaryotic genomic islands. PLoS Genetics 1, no. 5:540–550. Juhas, M., D. W. Crook, I. D. Dimopoulou, G. Lunter, R. M. Harding, D. J. Ferguson, and D. W. Hood. 2007a. Novel type IV secretion system involved in propagation of genomic islands. Journal of Bacteriology 189, no. 3:761–771. Juhas, M., P. M. Power, R. M. Harding, D. J. P. Ferguson, I. D. Dimopoulou, A. R. E. Elamin, Z. Mohd-Zain, et al. 2007b. Sequence and functional analyses of Haemophilus spp. genomic islands. Genome Biology 8, no. 11:R237–R237.14. Karlin, S. 2001. Detecting anomalous gene clusters and pathogenicity islands in diverse bacterial genomes. Trends in Microbiology 9, no. 7:335–343. Kilian, M., K. Poulsen, T. Blomqvist, L. S. Håvarstein, M. Bek- Thomsen, H. Tettelin, and U. B. Sørensen. 2008. Evolution of Streptococcus pheumoniae and its close commensal relatives. PLoS One 3, no. 7:e2683.1–e2683.11. Kim, J. F., J. H. Ham, D. W. Bauer, A. Collmer, and S. V. Beer. 1998. The hrpC and hrpN operons of Erwinia chrysanthemi EC16 are flanked by plcA and homologs of hemolysin/ adhesin genes and accompanying activator/transporter genes. Molecular Plant Microbe Interactions 11, no. 6: 563–567. Köhler, T., C. van Delden, L. K. Curty, M. M. Hamzehpour, and J. Pechere. 2001. Overexpression of the MexEF-OprN multidrug efflux system affects cell-to-cell signaling in Pseudomonas aeruginosa. Journal of Bacteriology 183, no. 18:5213–5222. Kurland, C. G., B. Canback, and O. G. Berg. 2003. Horizontal gene transfer: A critical view. Proceedings of the National Academy of Sciences USA 100, no. 17:9658–9662. Kutter, S., R. Buhrdorf, J. Haas, W. Schneider-Brachaert, R. Haas, and W. Fischer. 2008. Protein subassemblies of the Helicobacter pylori Cag type IV secretion system revealed by localization and interaction studies. Journal of Bacteriology 190, no. 6:2161–2171. Lawrence, J. G. and H. Ochman. 1998. Molecular archaeology of the Escherichia coli genome. Proceedings of the National Academy of Sciences USA 95, no. 16:9413–9417. Lefébure, T. and M. J. Stanhope. 2007. Evolution of the core and pan-genome of Streptococcus: Positive selection, recombination, and genome composition. Genome Biology 8, no. 5:R71–R71.17. Linares, J. F., I. Gustafsson, E. Baquero, and J. L. Martínez. 2006. Antibiotics as intermicrobial signaling agents instead of weapons. Proceedings of the National Academy of Sciences USA 103, no. 51:19484–19489. Macinga, D. R. and P. N. Rather. 1999. The chromosomal 2′N-acetyltransferase of Providencia stuartii: Physiological functions and genetic regulation. Frontiers in Bioscience 4: d132–140. Mandel, M. J., M. S. Wollenberg, E. V. Stabb, K. L. Visick, and E. G. Ruby. 2009. A single regulatory gene is sufficient to alter bacterial host range. Nature 458, no. 7235:215–218. Martínez, J. L. 2008. Antibiotics and antibiotic resistance genes in natural environments. Science 321, no. 5887: 365–367. Maurelli, A. T., R. E. Fernández, C. A. Bloch, C. K. Rode, and A. Fasano. 1998. “Black holes” and bacterial pathogenicity: A large genomic deletion that enhances the virulence of Shigella spp. and enteroinvasive Escherichia coli. Proceedings of the National Academy of Sciences USA 95, no. 7:3943–3948. Mazmanian, S. K., C. H. Liu, A. O. Tzianabos, and S. L. Kasper. 2005. An immunomodulatory molecule of symbiotic bacteria directs maturation of the host immune system. Cell 122, no. 1:107–118. McDaniel, T. K. and J. B. Kaper. 1997. A cloned pathogenicity island from enteropathogenic Escherichia coli confers the attaching and effacing phenotype on E. coli K-12. Molecular Microbiology 23, no. 2:399–407. Medini, D., D. Serruto, J. Parkhill, D. A. Relman, C. Donati, R. Moxon, S. Falkow, and R. Rappuoli. 2008. Microbiology in the post-genomic era. Nature Reviews Microbiology 6, no. 6:419–430. Melchers, L. S., D. V. Thompson, K. B. Idler, R. A. Schileperoort, and P. J. J. Hooykaas. 1986. Nucleotide sequence of the virulence gene virG of the Agrobacterium tumefaciens octopine Ti plasmid: Significant homology between virG and the regulatory genes ompR, phoB and dye of E. coli. Nucleic Acids Research 14, no. 24:9933–9942. Mignot, T., M. Mock, D. Robichon, A. Landier, D. Lereclus, and A. Fouet. 2001. The incompatibility between the PlcR- and AtxA-controlled regulons may have selected a nonsense mutation in Bacillus anthracis. Molecular Microbiology 42, no. 5:1189–1198. Monack, D. M., J. Mecsas, N. Ghori, and S. Falkow. 1997. Yersinia signals macrophages to undergo apoptosis and YopJ is necessary for this cell death. Proceedings of the National Academy of Sciences USA 94, no. 19: 10385–10390. Mushegian, A. R, K. J. Fullner, E. V. Koonin, and E. W. Nester. 1996. A family of lysozyme-like virulence factors in bacterial pathogens of plants and animals. Proceedings of the National Academy of Sciences USA 93, no. 14: 7321–7326. Nakamura, Y., T. Itoh, H. Matsuda, and T. Gojobori. 2004. Biased biological functions of horizontally transferred genes in prokaryotic genomes. Nature Genetics 36, no. 7:760–766. Nakata, N., T. Tobe, I. Fukuda, T. Suzuki, K. Komatsu, M. Yoshikawa, and C. Sasakawa. 1993. The absence of a surface protease, OmpT, determines the intercellular spreading ability of Shigella: The relationship between the ompT and kcpA loci. Molecular Microbiology 9, no. 3: 459–468. Ochman, H., J. G. Lawrence, and E. A. Groisman. 2000. Lateral gene transfer and the nature of bacterial innovation. Nature 405, no. 6784:299–304. Ochman, H. and N. A. Moran. 2001. Genes lost and genes found: Evolution of bacterial pathogenesis and symbiosis. Science 292, no. 5519:1096–1098. Oswald, E., J. Nougayrède, F. Taieb, and M. Sugai. 2005. Bacterial toxins that modulate host cell-cycle progression. Current Opinion in Microbiology 8, no. 1:83–91. Pan, X., A. Lührmann, A. Satoh, M. L. Laskowski-Arce, and C. R. Roy. 2008. Ankyrin repeat proteins comprise a diverse family of bacterial type IV effectors. Science 320, no. 5883:1651–1654. Parkhill, J. and C. Berry. 2003. Relative pathogenic values. Nature 423, no. 6935:23–25. Pawlowski, K. and T. Bisseling. 1996. Rhizobial and actinorhizal symbioses: What are the shared features? The Plant Cell 8, no. 10:1899–1913. Pegues, D. A., M. J. Hantman, I. Behlau, and S. I. Miller. 1995. PhoP/PhoQ transcriptional repression of Salmonella typhimurium invasion genes: Evidence for a role in protein secretion. Molecular Microbiology 17, no. 1:169–181. Piddock, L. J. 2006. Multidrug-resistance efflux pumps— not just for resistance. Nature Reviews Microbiology 4, no. 8:629–636. Preston, G. M., B. Haubold, and P. B. Rainey. 1998. Bacterial genomics and adaptation to life on plants: Implications for the evolution of pathogenicity and symbiosis. Current Opinion in Microbiology 1, no. 5:589–597. Purdom, G. and K. L. Anderson. 2008. Analysis of Barry Hall’s research of the E. coli ebg operon: Understanding the implications for bacterial adaptation to adverse environments. In Proceedings of the Sixth International Conference on Creationism, ed. A. A. Snelling, pp. 149–163. Pittsburgh, Pennsylvania: Creation Science Fellowship and Dallas, Texas: Institute for Creation Research. Reynolds, S. and J. Rolff. 2008. Immune function keeps endosymbionts under control. 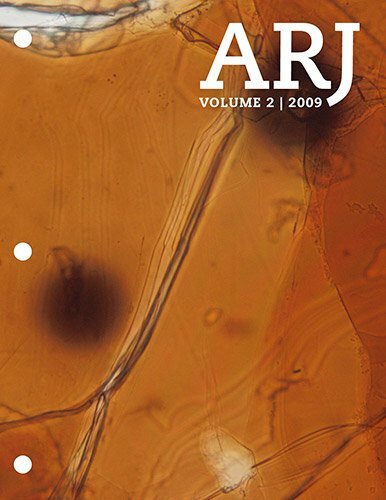 Journal of Biology 7: 28–28.5. Salamitou, S., F. Ramisse, M. Brehélin, D. Bourguet, N. Gilois, M. Gominet, E. Hernandez, and D. Lereclus. 2000. The plcR regulon is involved in the opportunistic properties of Bacillus thuringiensis and Bacillus cereus in mice and insects. Microbiology 146, no. 11:2825–2832. Schmidt, H. and M. Hensel 2004. Pathogenicity islands in bacterial pathogenesis. Clinical Microbiology Reviews 17, no. 1:14–56. Sentchilo, V., R. Ravatn, C. Werlen, A. J. Zehnder, and J. R. van der Meer. 2003. Unusual integrase gene expression on the clc genomic island in Pseudomonas sp. strain B13. Journal of Bacteriology 185, no. 15:4530–4538. Snyder, L. A. and N. J. Saunders. 2006. The majority of genes in the pathogenic Neisseria species are present in nonpathogenic Neisseria lactamica, including those designated as ‘virulence genes’. BioMed Central Genomics 7: 128–128.11. Staley, J. T. 2006. The bacterial species dilemma and the genomic-phylogenetic species concept. Philosophical Transactions of the Royal Society B361, no. 1475: 1899–1909. Sullivan, J. T., J. R. Trzebiatowski, R. W. Cruickshank, J. Gouzy, S. D. Brown, R. M. Elliot, D. J. Fleetwood, et al. 2002. Comparative sequence analysis of the symbiosis island of Mesorhizobium loti strain R7A. Journal of Bacteriology 184, no. 11:3086–3095. Véscovi, E. G., F. C. Soncini, and E. A. Groisman. 1996. Mg2+ as an extracellular signal: Environmental regulation of salmonella virulence. Cell 84, no. 1:165–174. Vogel, J. P., H. L. Andrews, S. K. Wong, and R. R. Isberg. 1998. Conjugative transfer by the virulence system of Legionella pneumophila. Science 279, no. 5352:873–876. Welch, R. A., V. Burland, G. Plunkett III, P. Redford, P. Roesch, D. Rasko, E.L. Buckles, et al. 2002. Extensive mosaic structure revealed by the complete genome sequence of uropathogenic Escherichia coli. Proceedings of the National Academy of Sciences USA 99, no. 26:17020–17024. Williams, K. P. 2002. Integration sites for genetic elements in prokaryotic tRNA and tmRNA genes: Sublocation preference of integrase subfamilies. Nucleic Acids Research 30, no. 4:866–875. Wilson, J. W., C. M. Ott, K. Höner zu Bentrup, R. Ramamurthy, L. Quick, S. Porwollik, P. Cheng, et al. 2007. Space flight alters bacterial gene expression and virulence and reveals a role for global regulator Hfq. Proceedings of the National Academy of Sciences USA 104, no. 41:16299–16304. Wood, T. C. 2001. Genome decay in the mycoplasmas. ICR Impact #304. Wood, T. C. 2007. The origin of pathogenic bacteria by degeneration or design. Occasional Papers of the BSG 10:8–9. Yang, F., J. Yang, X. Zhang, L. Chen, Y. Jiang, Y. Yan, X. Tang, et al. 2005. Genome dynamics and diversity of Shigella species, the etiologic agents of bacillary dysentery. Nucleic Acids Research 33, no. 19:6445–6458.